All transactions are safe and secure with a reliable history in online purchasing behind each of our associates. 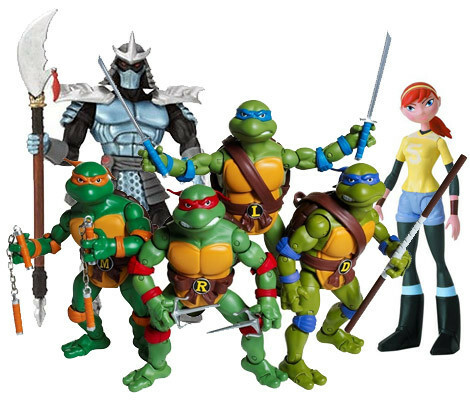 Buy the Teenage Mutant Ninja Turtles Action Figures to own TMNT clothing and merchandise. You don't have to go into the sewers to find the half-shelled heroes. Here, you will encounter a plethora of TMNT action figures, including the four pizza loving turtles, their friend and reporter April O'Neil, mentor Splinter, and their sidekick Casey Jones. Due battle with the classic Shredder action figure, a Foot Clan Ninja, Rocksteady and Bebop, who use the Technodrome as their rolling home base. Just be careful not to get trapped in Dimension X with Krang. Pair the toys with a t-shirt from the gallery. In addition to the Teenage Mutant Ninja Turtles Action Figures above, browse the TMNT Clothing Gallery for more apparel like men's and women's clothes, kids shirts or hoodies.